Shown in profile turned toward the right. Above at right is a window with two panels and a curtain. 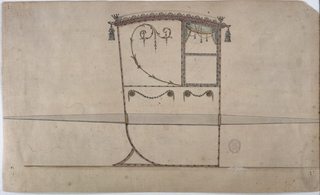 The panel beside is decorated with a scroll. The part below forms one panel and is decorated with two garlands laid upon two disks each at the upper corner similar to 3. At the corners of the rood are crowns and tassels.